Ready to make a change? You can commit to anything for just 30 days and the results are worth it and the rules aren’t tough! Here are 5 reasons why you should do the whole 30 diet and tips to get started. Leading up to the end of 2016, we kept hearing about this gig called Whole 30 all over the place but didn’t know what the heck it was or what all the hype was about. Well, one year ago my husband and I committed to doing the Whole 30 and it may have been one of the best decisions for our health ever and I seriously think everyone needs to do it! It isn’t just some weird fad or some magic pills to take — I’ve done those and this definitely isn’t that. A few years ago I told myself I had to lose 40 pounds before I could get pregnant. I wanted to be in a healthier place physically and emotionally before bringing a baby into this world, so I joined a gym, found accountability partners, and ate really strict counting calories. I did it and I felt great!! And then I got pregnant, had a baby, and the chocolate cravings came back with a vengeance. Life with a newborn was exhausting and I made that my excuse to eat whatever whenever and stopped exercising. My body was a disaster and I knew it, but I didn’t know how to flip things around. Finally, we decided something had to change and so we looked into whole 30 and committed. 30 days is nothing. I told myself I can do anything for 30 days. And we did it. It was amazing and totally worth it. Here are the top 5 reasons why you should do whole 30. Are you a sugar addict? I sure am. Maybe a froofy coffee drinker? Check. Do you crave dessert every night? That was me too. Doing Whole 30 changed all of that. That has to be one of the biggest things that I took away from the experience. Admittedly, I still like froofy coffee. The difference is though that I now get all my drinks half sweet. I know that isn’t as good as drinking it black but I’m getting there. Now if I feel myself craving sugar again, I can do a Whole 30 refresher and break the strangle hold that sugar has on me. Cutting sugar was also one of the hardest aspects of Whole 30. Do you know how many things have sugar in them that you wouldn’t expect?? One word here: Bacon. Who knew that bacon had added sugar in it?! Luckily, we were able to find sugar free bacon at our local butcher (which changed our lives…. seriously the best bacon I have ever had). Another added benefit of cutting added sugar is that I started to enjoy foods again that I didn’t before. Not gonna lie though, the first week or two was pretty rough. After getting through the initial high of starting off the month of clean eating, you start to feel down. Your body starts to lash out over the absence of the sugar with a fiery vengeance. First you get tired, then you get cranky. During this stage, the slightest irritation was enough to send the hubby and I into a full blown fight. Once you break through this stage though, it’s magical!! This is the part where you feel better than you ever have in your life and you experience life the way that it was meant to be lived. This is probably the reason why you’re doing Whole 30, which you might do, but let me tell you the other benefits that you will experience are much more powerful and unexpected. My husband and I lost a grand total of 30 lbs over the 3o days but the experience of Whole 30 was much more than that. If you have any gastric issues at all Whole 30 will have a measurable and significant impact on your issues. Our little girl was severely constipated before we started Whole 30 and we were to the point that the doctors were recommending that we start her on a daily regimen of Miralax to help get things flowing. Before we started something like giving her meds I wanted to get to the root of the problem. I asked them if we could try adjusting her diet and they agreed to give me a month. Now let’s be clear, our little girl has been eating much healthier than we have since she was old enough to start munching on avocado slices at 6 months old, however, we were definitely not getting enough vegetables in her or the most well-balanced diet. To make a long story short, she joined us on our Whole 30 adventure and by the time we were through all of us were very regular. The good habits are one of the most lasting effects of Whole 30. The most lasting effect of Whole 30 has honestly been sugar free bacon… In all seriousness, although we haven’t been eating strict Whole 30 since our 30 days finished, we have been eating much better as a whole. Our little girl is still pooping regularly (sometimes with the help of a little prune juice) and we are taking in about half the sugar as we did before Whole 30. We are also making a lot more of our meals at home and have many new healthy meals in our regular dinner rotation. After we had our little girl, we struggled to make a majority of our meals at home. The adjustment to living life with a little person was more of an adjustment than we expected but Whole 30 forced us to refocus and get back into the habit of making our food again. Want to know another thing that was an unexpected delight? Coconut milk lattes. Turns out, I love them. To this day, I still drink all of my coffee with coconut milk. We were told about this one by several people but we honestly didn’t think that we would get anything out of this. This is one case where we were definitely wrong. The first foods that we started to reintroduce after our 3o days were up was soy and beans. It was Valentines weekend and my husband made chicken fried rice and orange chicken, one of my favorites, for dinner and shortly after we started eating the hubby’s hands started to break out with itchy red spots and his chest tightened up. It turns out that he is allergic to soy and beans, which has made a significant impact on our lives since Whole 30. Do you know how many things have soy in them? Everything has soy. Chocolate and all the tasty things. Literally everything. But we never knew before. His body hid the allergy and would have been negatively affected for years if we hadn’t found out now. 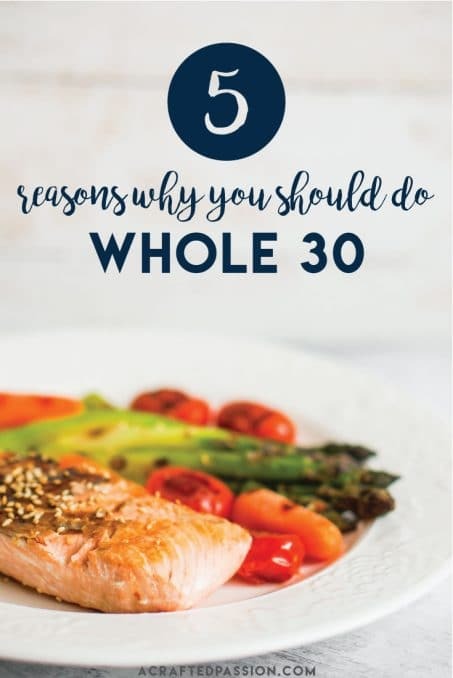 There are so many benefits to doing whole 30 and I’m so grateful we did it last year! Ready to get started with the Whole 30 Diet? Order this book right away so that you can get started soon after it arrives and start getting your health on the right track. While you wait for the book to arrive, read through the rules here. and then download the program PDFs at the bottom of the page. You will be referring to these on an almost daily basis until you get the hang of things so make sure you keep them handy. If you have any questions or need ideas for snacks, leave a comment below and I’d be happy to help!